The colorful and often way out there US Rep. Dennis Kucinich (D-OH) lost his primary battle last night in a newly Republican-drawn congressional district. Rep. Marcy Kaptur (D-Ohio) easily defeated Kucinich most likely ending his political career. With 100% of precincts reporting, Kaptur captured 56% to Kucinich’s 40%. 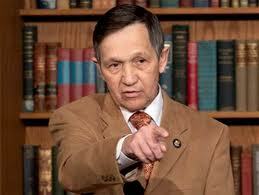 I can honestly say that I am going to miss Dennis Kucinich. He was certainly a character and not toxic like the Barney Frank’s of the world. He was way out there; however, the one thing that I could appreciate and respect regarding Dennis Kucinich was that he spoke his mind, laid it on the table and no matter what the subject matter, did not spin it and let you know exactly where he stood. That being said, I agreed with .0052% of Kucinich’s views and opinions, but that does not mean that we all should not respect him for being a straight shooter. Now that Marcy Kaptor has won the Democrat primary, she will face Joe the Plumber, Republican Samuel Wurzelbacher, in the 2012 general election. Kaptur will face Republican Samuel Wurzelbacher, better known as “Joe the Plumber,” in the general election. Wurzelbacher was given the moniker by the McCain-Palin presidential campaign, who in 2008 used Wurzelbacher as an example of disenfranchised blue-collar voters. He won the GOP primary by 51-49 over Steven Kraus. A 14-term congresswoman and the longest-serving female member of the House, Kaptur is poised to easily win reelection in November in the redrawn, Democratic-leaning district. In other incumbent races, Ohio Rep. Schmidt becomes first member ousted in 2012 primary. Could this be a sign of things to come in the 2012 elections for incumbents? Rep. Jean Schmidt (R-Ohio) became the first member of Congress to be defeated in a primary in 2012, losing her race on Tuesday to physician Brad Wenstrup. With 99 percent of precincts reporting, Wenstrup took 49 percent of the vote to Schmidt’s 43 percent. Two other Republicans who challenged Schmidt placed in the single digits. Can we think TEA party. Ohio is a good example of how the people are taking a good look at their existing represenatives at all levels. Incumbents that have been in the political offices for years and years will no longer get the advantage they once had of name recognition. It may turn out that the people are tired of their non-performance and will look to new faces to bring this country back towards the values of our founders.